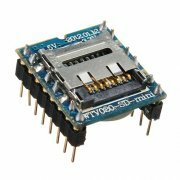 WTV020-SD-16P is a low cost and easy to use MicroSD MP3 module which supports WAV and AD4 formats. It support upto 1GB SD cards. It requires a 3.3V power supply for its operation and its power consumption is very low. You can easily copy voice files to SD Card using PC and it should be in FAT format. This module can be easily interfaced with Arduino Boards, Microcontrollers etc. It can also be used as standalone without any MCU. Please read the datasheet carefully before using this module. It has following modes of operation. Key Mode 1 – Having 3 group of voice. One key triggers one group with Vol+ and Vol- controls. Key Mode 2 – Having 5 group of voce. One key triggers one group. Loop Play Mode – This mode will play voice automatically after power up. It doesn’t needs any trigger. Another feature of this mode is memory feature, ie if the power was cut when you are playing 2nd voice, during next power up it automatically plays 2nd or 3ed voice. Serial Mode – This mode allows us to use an MCU to control the module via CLK and DI signals.